In 1973, Pyranha pioneered the formulation of concentrated insecticides for automatic spray systems: 1-10 PX. 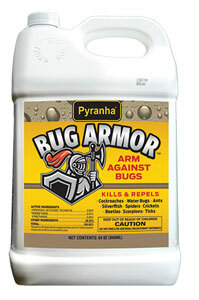 Since then, 1-10 PX became renamed and rebranded as Bug Armor — to “arm against bugs” and other pests such as cockroaches, ants, silverfish, spiders, crickets, beetles, scorpions, ticks and more. One 64-oz. bottle can make up to 200 diluted gallons to use as surface, premise or animal spray. It can be used in automatic misting systems or non-thermal foggers, and is labeled for use around cattle, sheep, goats, swine, horses, poultry and dogs. At press time, it is not available in New York State.